Carob gummies are one of my favourite options because they are practically guilt-free. 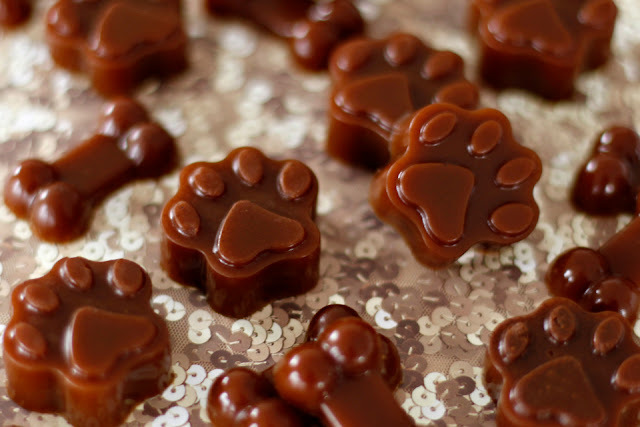 Our dogs LOVE carob and are wild for their gummy treats, and they're easy to make in fun shapes, too. 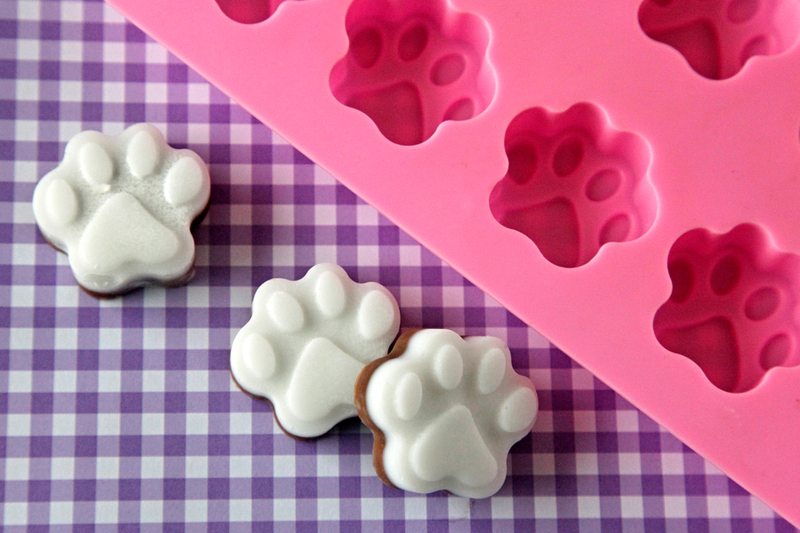 Great for using your dog or holiday molds for a fun festive treat. See our detailed post here on making Guilt-Free Healthy Carob Gummy Easter Dog Treats. The pictured treats above are made in exactly the same way, but include a little splash of lactose-free trim milk in the water to make the treats slightly opaque, like a milk chocolate gummy without any of the chocolatey badness. Pawesome! Another easy molded treat option is to use coconut oil and make "dogolates" with carob. If you're into supplementing your dogs with coconut oil, this can turn that supplements into an occasional small treat. Coconut oil is almost exclusively fat and so it requires careful consideration of suitability and moderation for pet (or human) diets; however, it can potentially be beneficial for energy, metabolism, digestion, mobility, skin/coat, and other health factors, which is why we give our dogs in small quantities. Perhaps more often, I also use it topically on the dogs to sooth dry or sore spots (and on myself too). Looking for more info? Dogs Naturally has good summary information posted here and here. 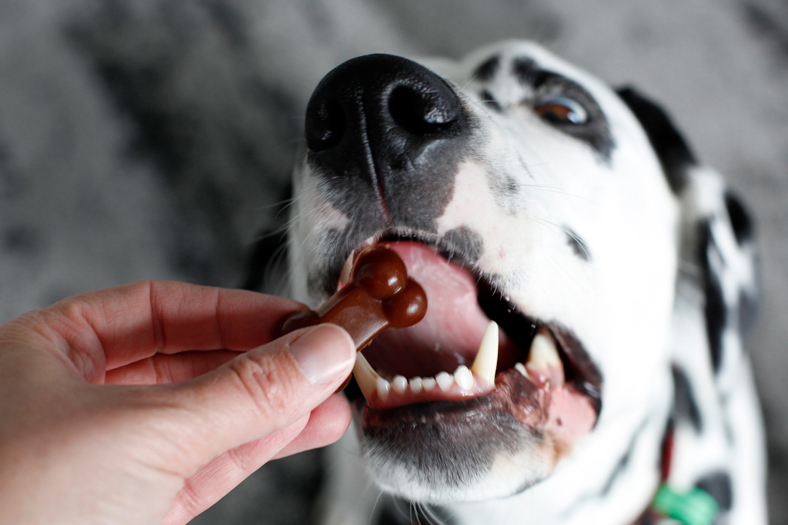 You can find our detailed post of making simple coconut oil dog treats here, and check out our peanut butter and carob Easter treats for an more on layering with coconut oil (and why I like to layer when using powdered carob in oil). Sharing actual chocolate is a doggy no-no, so make sure the Easter bunny knows to be extra cautious about hiding anything that your pup might get and Easter baskets are kept safe from any four-legged chocolate snatchers. Chocolate is one of the most common causes of accidental dog poisoning around the home, with human holiday sweets raising the risks. While the high sugar and/or fat content of many human treats are bad for dogs, chocolate presents the extra risk of theobromine, which is toxic to dogs. The quantity of theobromine varies and the effect on a dog will depend on quantity consumes, size of the dog, and pre-existing health issues. Contact your trusted vet for emergency advice if you are ever in doubt about something your pet has consumed. With those risks and issues in mind, you might then be surprised to discover that many commercial dog-friendly "chocolate" treats contain sugars, oils/fats, and some even use cocoa powder. Eek! Always check ingredient labels and choose with awareness. While very small quantities may not cause harm, why risk it when carob is a yummy dog-friendly (and healthy) alternative? Have a safe and happy Easter, furfriends! If you're looking for more fun Easter ideas, you can find all of our Easter-related posts here or drool through all of our treat-related posts. We won't be posting next Monday on the Easter holiday, but we'll be popping in on our social media and we'll be back on the blog the following week with all the details from Oli's upcoming 13th birthday celebration. Whoot whoot! With Oli's birthday, Easter, ANZAC Day, and all of our usual chaos of daily life in betwen, it will be a busy couple of weeks here. See you again soon!